Once expensive and difficult to obtain, salt and peppercorns were highly valued trade items, and were considered a form of currency by certain peoples in ancient times. At your whim, Grind Away, the amount of salt or peppercorn, to meet your flavor needs at any moment. 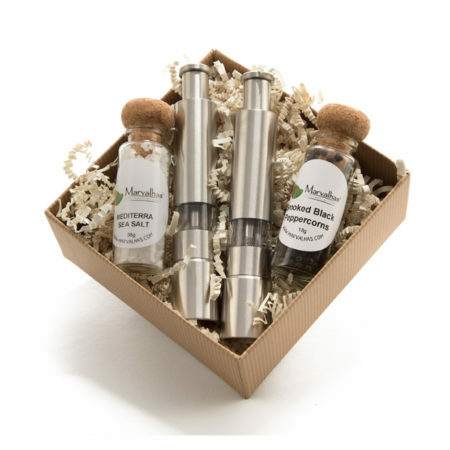 A fabulous gift or luxurious treat for yourself, includes a set of grinders and 1 vial of Mediterranean solar evaporated sea salt and 1 vial of exotic Smokey black whole peppercorns.